J.A. 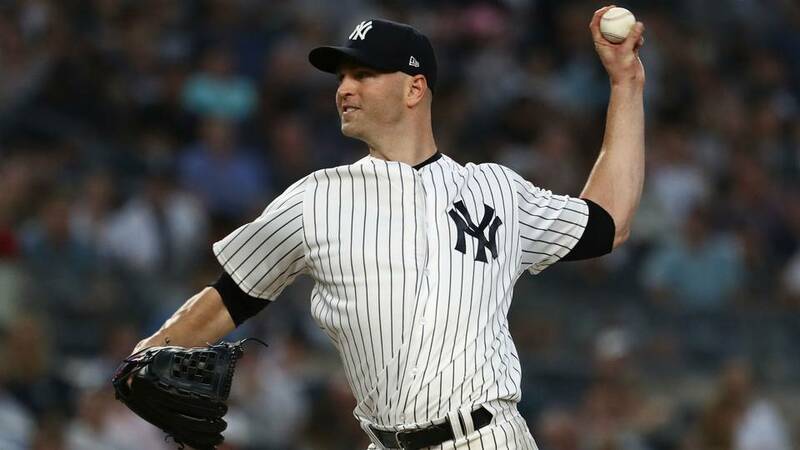 Happ will be the Yankees starter on Friday night at Fenway Park against the Boston Red Sox in Game 1 of the American League Division Series. Happ earned the nod by going 7-0 with a superb 2.69 ERA since joining the Yankees from the Toronto Blue Jays on July 26. Happ addressed the media on Thursday in Boston, and he started off the press conference with some levity when he replied to the question of how he will go about attacking the Red Sox with, "I don't think it makes a whole lot of sense for me to tell you that" while laughing. Q. What would you say you want to focus on tomorrow? J.A. HAPP: I want to focus on being aggressive and trusting my stuff and just continuing to kind of sort of do what I do and trust that's going to be enough; that this game is another game. It's a big game, but going to treat it like another one. Q. What's history against a particular team mean when you have a career record against the Red Sox? You discard games like they're totally different personnel or does it mean comfort in a ballpark versus an organization? How much does that matter to you? J.A. HAPP: I think it depends on how you look at it. I'm going to try to take positives from it, regardless what numbers say and what the team is. Maybe rely on some past experience and maybe some knowledge gained from that. But once you're out there, I'm just kind of competing. Q. J.A., what does it mean to you to get the ball in Game 1? And how hostile do you think the environment will be tomorrow? J.A. HAPP: I mean, it feels good. I expect to go out and perform. And I'm happy to have the ball for sure. You know, these games, you know, I've learned since I came over here in the short while, can be intense. And I certainly expect a lot more of that. But to be honest, I don't put a ton of thought into that. I try to block a lot of that part out. I'm sure it will be plenty loud. Q. From your perspective, you know this team well and they know you very well as well. In your opinion, does that give the pitcher an advantage, the hitter advantage? Do you see one way or another, or up to execution on game day? J.A. HAPP: Again, it's whatever way you want to take it. If you look at general trends, probably seeing guys more often than not will probably benefit the hitter. At the same time more often than not it's about execution. So that's kind of going to be my focus, execution and trusting my stuff. Q. I guess, just to follow up on that, is it a good thing or bad thing that you just faced this team here in this building? And what did you take from that start? J.A. HAPP: You know, I'm going to put that out of my head. I don't know the answer to that, really. It kind of is what it is. I think we were in a position where it made sense to do what we did. You know, every game is different at the same time. So it's whatever way. I'm just going to try to stay positive and you know probably not worry about that too much. Q. When you have had success against a certain organization over the years, how much does confidence play into that going into a game against that team? J.A. HAPP: It's a factor, for sure. Confidence and success feed off each other. You know, that's just in general. Not really for one specific team. You know, this is a team that won 108 games. You don't see that very often. It's a team that is probably as dynamic a team as there is in baseball. So you know, I'm certainly aware of their capabilities. And never take anything for granted. So it's going to be fun. Q. J.A., how much value do you put on your own past playoff experience? And how much do you think you've evolved as a big-game type pitcher in the last three seasons? J.A. HAPP: I feel like my game has come a long way in the last few years, especially early on from some of my previous kind of playoff experiences with Philadelphia. I think this most recent one with Toronto a few years back in '16 is more similar to the kind of pitcher that I am now. So I'll rely on that a little bit, but again to me I'm trying to treat it as another game. That's part of our season. I'm certainly aware of the ramifications of where we're at. That's my focus, is continuing to prep and just be ready on game day. That's supposed to be the fun day. Q. J.A., it seems like this is the game the Yankees traded for you for. Do you look at it that way? And is this what you thought of when they got you, that Red Sox in the playoffs and a Game 1 situation would be your spot? J.A. HAPP: No, I don't think I thought about that coming over here. I think my thought was I was part of a piece that could potentially help them get wherever they wanted to be. I didn't think of it in terms of specifics. I'm certainly happy to have the ball tomorrow and feel honored to have it. Q. J.A., just in general, in your short experience as a Yankee, has this been more fun than you expected? How has it been just experiencing this the last two months? J.A. HAPP: The last two weeks have been great. I think you don't know what to expect. When you get traded to a contender who has a chance to play in October, that's why you're playing. You got to take the positives and look at it as positive. It's been fun being a part of that. You know, we look forward to keep going.